Trinity's Book Club . . . has their next meeting on Tuesday, April 23th at Panera Bread (Mayfaire) at 6:30 pm. The book entitled "Becoming Mrs. Lewis" by Patti Callahan. For additional information, contact Teresa Lee at 910-512-5121. "A New Day in the City" Study - How do we grow from here? We are getting back to "normal" but we want to continue to discover God's great hope for Trinity. What does that look like? Want to be part of the conversation? Pastor Tara will lead a study from the book, "A New Day in the City". A group is forming for this high participation study Wednesday nights following Easter. All are encouraged to join us. Tara will lead a brief information session about this study on Sunday, April 28th following each service. Email Tara or call Tara at church to find out more! Yard Sale - United Methodist Women are having a yard sale on Saturday, May 4th, from 7:00 am to 12:00 pm at the Family Life Center. Items may be brought to the Family Life Center on Thursday, May 2nd after 12:00 pm and all day on Friday, May 3rd. Gently used items such as house wares, small appliances, small pieces of furniture, toys, books, baby items, and seasonal items are appreciated. Proceeds will be used to help with UMW's service and missions projects. Our 132nd Pancake Breakfast . . . will be held on Saturday, May 11th from 7:30 am to 11:00 am at the FLC. The proceeds will go to Medical Mission International (MMI). Come out and support this worthwhile cause. 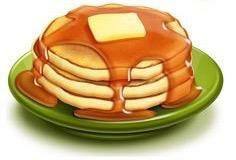 If you are interested in being a volunteer at any of our Pancake Breakfasts, contact Teresa Lee. Muffins for Mom . . . Celebrate Mother's Day by joining us before and after both worship services for muffins and juice on Sunday, May 12th. We nurture our members and supporters through Christian education and through acts of compassion and fellowship.